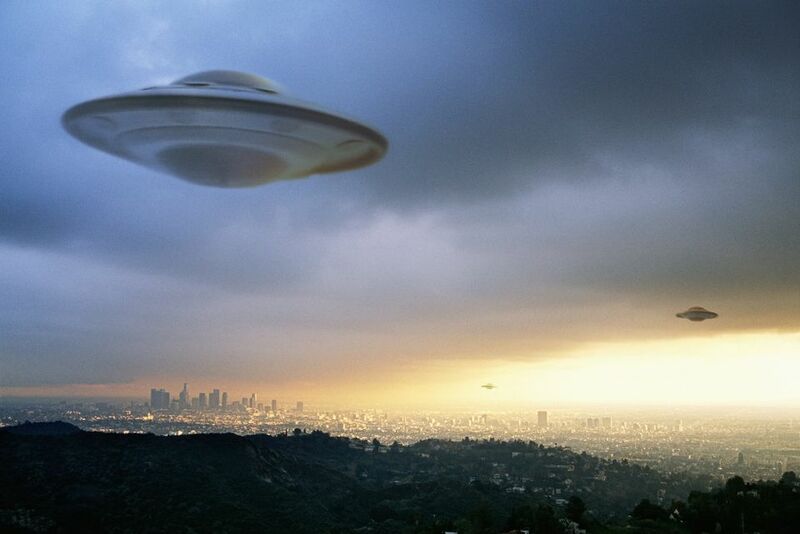 The state of Ohio is one of the most active spots in the nation for UFO sightings. In fact, it ranks second in the United States for unexplained UFO sightings. An online search yields hundreds of unexplained incidents around the Cleveland area, thousands more throughout Ohio, and even a few websites devoted specifically to Ohio UFOs. Many reports of UFOs are of the “someone on their porch late at night saw some strange lights in the sky” variety. But, there are plenty of sightings that draw a little more interest – ones that are reported by multiple people at the same time, or ones that involve an actual sighting other than simply “strange lights.” The majority of sightings do end up with a plausible explanation, but there are cases that are never really resolved. Here’s a look at some of the most famous UFO sightings in the Cleveland area. This is probably the most famous UFO sighting in Ohio. On the morning of April 17, 1966, just after 5 am, two police officers from Portage County, Ohio, were checking on an abandoned vehicle on the side of Route 224. While outside their vehicle, the officers saw a large, metallic, disc-shaped object nearby. The object flew directly over the police cruiser, shining a bright light on them that one of the officers said was “like high noon.” The object hovered nearby but would move away whenever the officers tried to approach it. The men eventually chased the object east into Pennsylvania, where they would later receive orders to abandon the chase. The men lost sight of the craft after about 30 minutes. Several police officers from other jurisdictions had joined the chase, and several civilians reported seeing the same object at about the same time. An official investigation determined that the officers had chased a communication satellite, and then the planet Venus – an answer the pursuing officers found completely inaccurate. Because of public ridicule, the two main officers in this incident would quit their jobs and disappear from the public view. This incident is widely credited with inspiring a scene in the 1977 film "Close Encounters of the Third Kind." While in real life, Ohio officers chased the object into Pennsylvania, the film depicts Indiana officers chasing the object into Ohio. Sometimes referred to as the Cleveland Lights, the Lake Erie Lights is the name given to any number of strange, color-changing lights that people report seeing over Lake Erie. Local residents say these lights are unlike any plane or helicopter they’ve ever seen. Cleveland is the home of NASA’s Glenn Research Center, which tests certain rockets and specialty aircraft. Many people attribute the lights to testing there, but the center has frequently issued statements that they didn’t have testing that coincided with the appearance of the lights. The most commonly offered explanation from the U.S. and Canadian Coast Guards is that the lights are just television and radio towers along the Canadian shore of Lake Erie or a windmill farm along the same area. Weather conditions have to be very specific for Ohio residents to see the Canadian border, which would explain why the lights are rarely seen. But that explanation doesn’t mesh with what many residents claim to see – the lights will sometimes move up and down, dim and brighten, and change colors several times. Sightings of the Lake Erie Lights generally come in waves, appearing several nights in a row, then not showing up again for a few months. On Oct. 18, 1973, four men on an Army Reserve helicopter flying from Columbus to Cleveland reported seeing a strange red light on the horizon. The light was brighter than any aircraft or radio tower the men had ever seen before, so they watched it cautiously. The light appeared to be heading on a collision course with the helicopter, so the pilot (Capt. Lawrence Coyne) lowered his altitude to about 2,000 feet to avoid the approaching craft. Just as the object was about to collide with the helicopter, it stopped and hovered just above. The men could now see that this was a metallic, cigar-shaped object​ and that in addition to the intense red light, there was a white light on the stern of this craft, and a green pyramid-shaped beam of light pointing straight down. The men reported that the green beam turned upward, and swept over the helicopter’s windshield, enveloping the whole cockpit in green light. The object then turned and sped off – performing maneuvers the men had never seen in their life. When the pilot looked back at his controls, his compass was spinning rapidly and his altimeter was reporting a height of 3,500 feet and climbing, despite the fact that he hadn’t given it any power since he dropped down to under 2,000 feet and that his steering mechanism was still in the “full down” position. The four men’s report on this incident was deemed the “most scientifically valuable report of 1973” by the National Enquirer – winning them the “Blue Ribbon Panel” award and $5,000. On Dec 14, 1994, multiple people in Trumbull County, Ohio, reported seeing an unusual object in the sky. Around midnight, the county’s 9-1-1 call center was flooded with calls about strange lights in the sky. Soon, police offers began making reports to their dispatch stations on the strange object as well. While the reports were initially downplayed, after officers from several different stations made similar reports, the situation became a little more serious. The object was detected by National Weather Service radar in the area, with an operator saying that he had never seen an object move so quickly. While the description of the color of the object’s light varied, from bright white to red to blue, virtually all the witnesses described it as being an object that rotated on an axis with some sort of protrusion on top almost like a parachute. Almost every witness also reported that the craft made no sound. An officer sent to investigate the incident that when his vehicle neared the area where the craft was reported, his car suddenly shuts off. At that moment, an intense white light “like daylight” hit the vehicle from above. The light stayed above his car for about 30 seconds and then sped off. Once the object left, his car started back. An official explanation was never offered. The FAA briefly investigated and had no reports of aircraft that should have been in that area. There is a military facility nearby – the Youngstown-Warren Air Reserve Station. While that station does sometimes unique aircraft, it’s unlikely that testing would occur over a populated area. Unless an incident is presenting an immediate danger to you or someone around you, it’s probably best not to contact local police authorities just because you saw something unusual in the sky. There is someone that’s interested in hearing you out, though. Cleveland is actually the home of the oldest UFO group in the world – the Cleveland Ufology Project (CUP). The group was founded in March of 1952 and investigates UFO sightings and similar phenomena. The group holds public meetings the third Saturday of every month. How Do I Find an AA Meeting in the Cleveland Area?